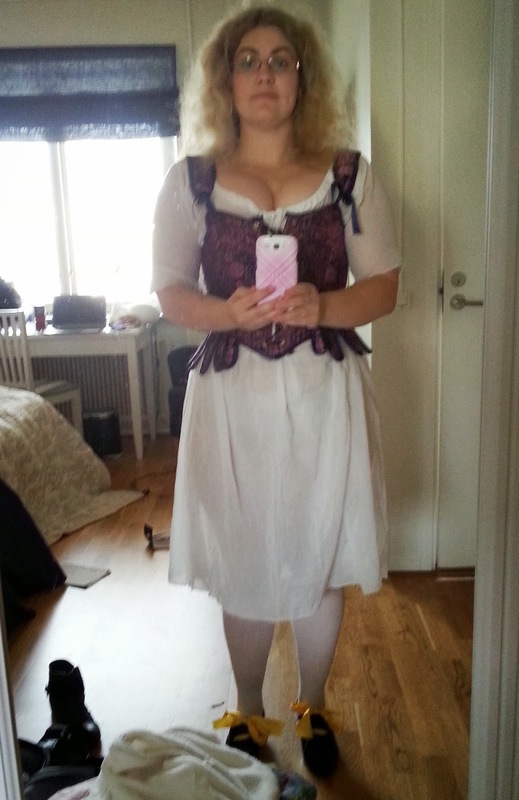 Here is what I do when I want to get ready in my 18th century gowns. This is a series of photos I took when getting dressed in my Snow White costume. Step 1. Put on the chemise, stockings and shoes. It's important to put the shoes on almost first, because when the stays are put on and laced tight it can be hard to bend down and fiddle with the fastenings. Step 2. Put the stays on, don't pull it so tight that it's uncomfortable. Step 3. Fix the hair so it's ready. Also if you have worn the stays for a while you can usually pull them a bit tighter, since the body has adapted to them. I'm doing the hair fairly early in the process. I don't like fiddling with the hair, and if something goes wrong it's better to have started early than having it be the last thing that you need to rush to be finished. Step 4. Put the false rump on, or if you are wearing pocket hoops or panniers. My false rump started it's life as an 1880's travelling bustle. There are three layers of ruffles of some stiff fabric, inbetween two of the layers I also have a small stuffed pillow. In order to get the 1880's silhouette I had strings that shaped it into a narrow but bulging bustle, for the 1780's silhouette I removed strings and that gave it a flatter and more rounded shape. Step 5. Petticoat time. For a long time I didn't understand why people where going on about the needs for many petticoats. Surely one was enough. Well I was totally wrong. I used to just have one made out of old sheets. Then last year I made two cotton voile petticoats, and what a difference. The second petticoat works miracles when it comes to attaining a bigger, poofier shape, it's needed to hide the support structures, and it makes the outer skirt/petticoat lay smoother. For my 18th century outfits it made them look better, but it wasn't gamechangning, but a second lightweight petticoat was what was needed to hide the hoops of my hoopskirt to the Amidala Travel Gown, and make the skirt to that one lay flat. It's better to have more petticoats out of soft and light fabrics than one heavy petticoat. Step 6. 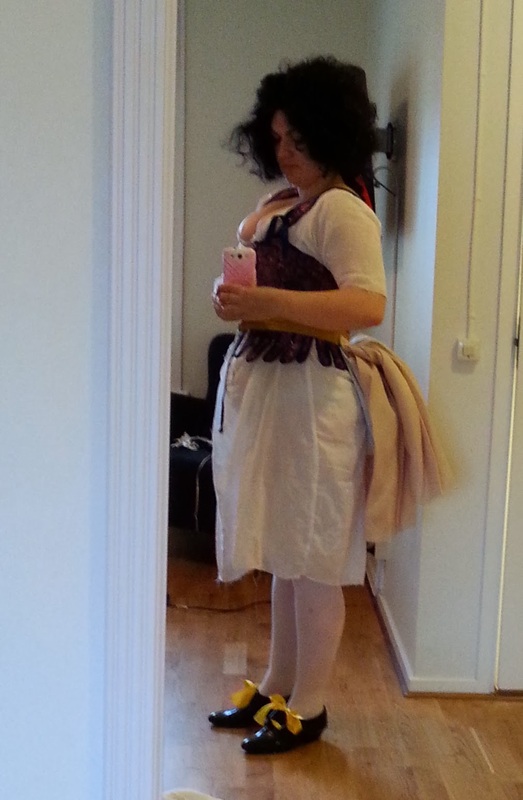 Put on the main petticoat (outer skirt). Tie the loose pocket on over the petticoat. It's possible to have the pocket under the petticoats, since they have openings in the sides, but I prefer to wear it like this since it's easier to get to the pocket. I've embroidered the pocket so I don't mind showing it either. I try to fix the last details on my hair and make up now, before putting the robe on. I have a problem lifting my hands up over my shoulders in the robe. Step 7. Put the robe on, fix the last things and have fun. In fact this is the one step that I think is the hardest to do by myself. 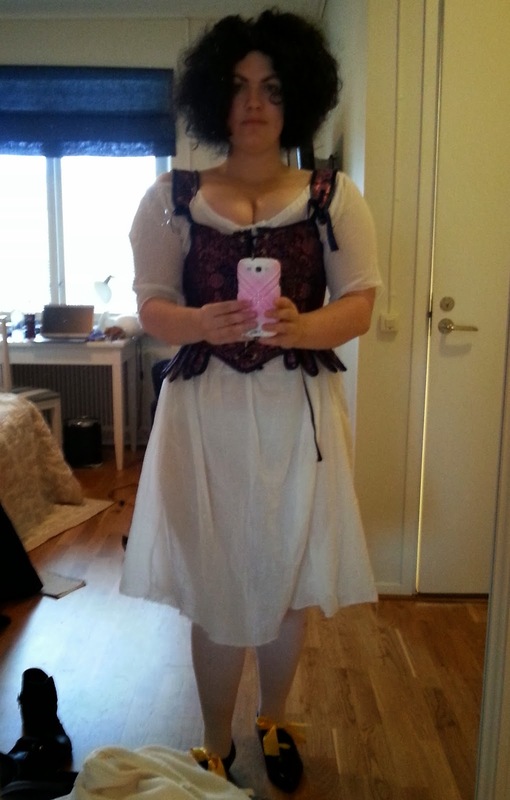 The bodice and sleeves are so tight that it would be a lot easier to have a handmaid, but I can make all on my own. This is just me wearing my 1780's ensemble, but the principle for how you get dressed is basically the same as long as there are corsets and supports involved.